A pair of Eastern Bluebirds. Last Sunday, Rob and I joined the president of the Ontario Eastern Bluebird Society, Bill Read, and a few others on a field trip. We had joined the organization last year after learning about it, and had been looking forward to the trip for months. 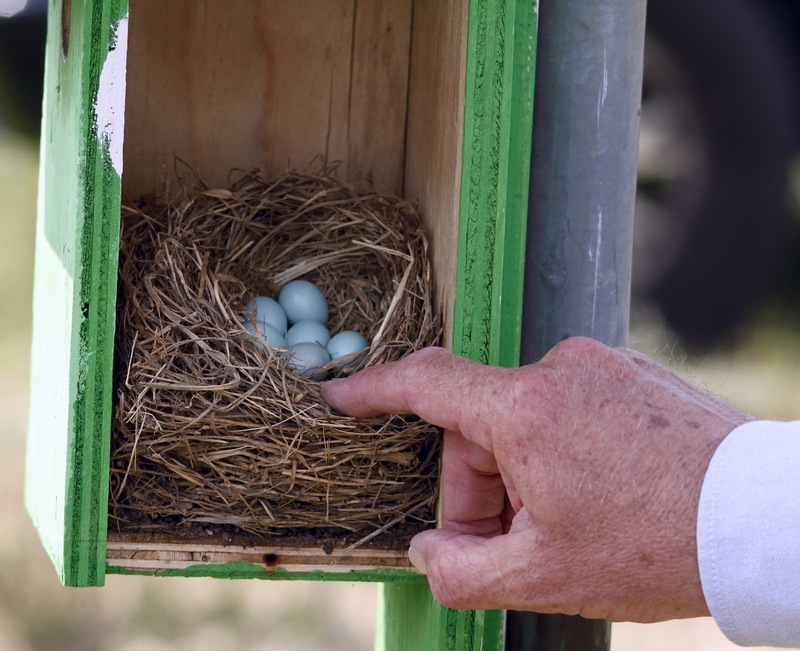 We went to a private orchard that had many, many, Eastern Bluebird nest boxes set up. Eighteen pairs of Eastern Bluebirds had successfully taken a box as a home to raise a family. 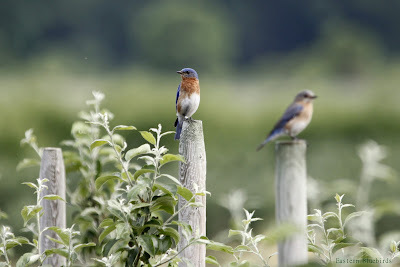 You can learn all about Eastern Bluebirds through the organizations website. 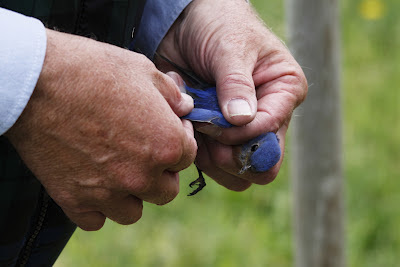 Bill aging an adult male Eastern Bluebird. The day was very informative and interesting. Bill banded some adults and chicks. It was really amazing to learn and see things about these birds that we never would of on our own. A nest full of Eastern Bluebird eggs. Bill told us that some females lay white eggs, and if they do, they will always lay white eggs. I was happy we got to see these pretty blue ones. When you are near a nest with chicks in it, the parents are always close by and keeping an eye on things . The day took a very up-close and personal turn with the discovery of a parent abandoned nest box with 5 cold and hungry chicks inside. Bill monitors these boxes and knew that something had happened to the male, but the female had been around the day before, but not today. Sometimes when the "pair bond" gets broken the other deserts the nest/chicks to find a new mate. Nature can be cruel sometimes. Our first job was to get these chicks warm, and the warmth of our hands was perfect. So, for the next little while we walked around cupping a five day old chick in our hands. It wasn't hard to tell when they were warm, because when they were they started peeping and begging for food. Next up, the bug hunt! This wasn't an easy task with all the dry weather, but a couple of girls in the group were great at it and got the little guys fed. Once Bill was satisfied that the birds were warm and well fed he put them in a nest box in his car, where they would be warm and safe. After the field trip he was hoping to relocate them to another nest box in the orchard with parents. That's one of the things I love about birding and doing trips like this one, you never know what's going to happen on an outing. What a day! Cool pix! Any day spent with Bill Read and bluebirds is a pleasure.